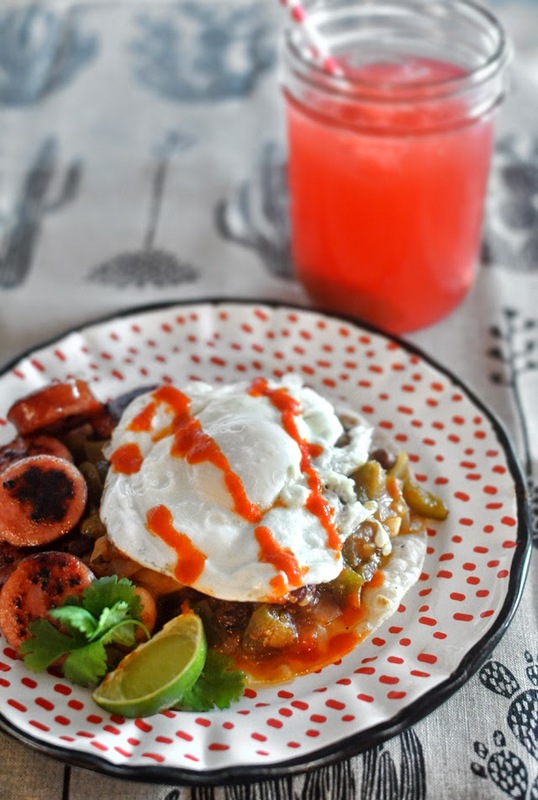 I am looking forward to dinner tonight, we will be having tacos, but to really start of Cinco de Mayo properly (or as best as I could with stuff I had home) I made Huevos Rancheros for breakfast. Or a version of. 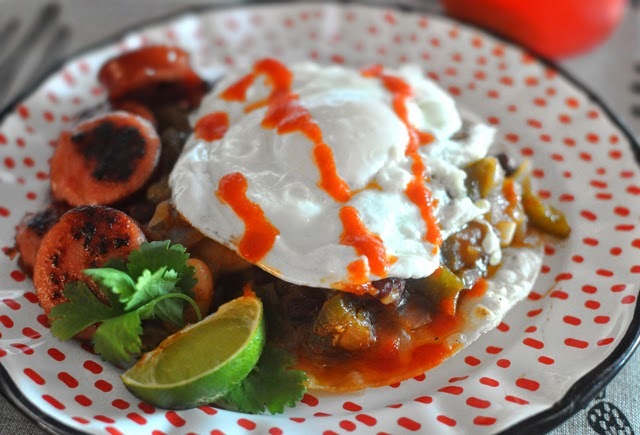 There was a tortilla on the bottom, there was a fried egg on top, and then lots of yummy stuff in between. And that stuff is actually pretty awesome. Kielbasa was something to make Chris happy, but sauteed and then baked veggies and beans that were the base were the tastiest part of the meal. I recommend making this for brunch (or lunch/dinner) as it can be quite heavy first thing in the morning, unless you love a big hearty breakfast. I had fresh strawberry lemonade with the meal, it is Monday morning after all, but this would be perfect with a Margarita or a Bloody Mary. Start by preparing your veggies and beans and bacon. I had cooked beans I prepared in advance because I like to add them to salads, you can use canned as well. Chop the onions and peppers into little chunks. Fry the bacon chunks until nice and crispy and set aside. Saute onions and peppers on canola oil until softened then add the beans and bacon and season with cumin, sweet paprika, chili flakes, oregano and salt and pepper. Add the tomato paste and about two caps water and cook for a few minutes. Add the corn starch and cook until it thickens nicely. Transfer into a casserole dish (if you pan can't go into the oven) and sprinkle with cheese on top. Bake on 400 F for 15 to 20 minutes, until its nice and bubbly and cheese is melted.